“Western Eskimo” was a name used formerly for Inuinnaktun (also known as Coppermine or Inuinakton), an Eskimo-Aleut language of Nunavut and the Northwest Territories in Canada, centered on Victoria Island and the adjacent mainland. The Summer Institute of Linguistics classifies this and related dialects as Western Canadian Inuktitut. Unlike some dialects of indigenous Canadian languages spoken in eastern communities, it is generally written using the Latin alphabet rather than Canadian Aboriginal Syllabics. Statistics Canada figures identify the number of mother tongue speakers of all Inuktitut dialects as 28,000, but the actual number of Inuinnaktun speakers is about 2,000. 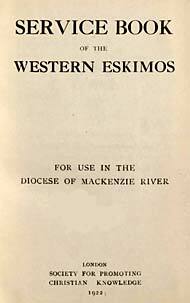 The Diocese of Mackenzie River was formed in 1884 from the Diocese of Rupert’s Land and was subsumed into the Diocese of the Arctic on its creation in 1930. The table of contents notes that this book was “Compiled and revised by the Ven. Archdeacon C. E. Whittaker with many additional translations by the Rev. Edward Hester and the Rev. H. Girling.” Charles Edward Whittaker (1864-1947) graduated from Wycliffe College, Toronto, in 1895. He was ordained deacon in 1897 and priest in 1898 by William Carpenter Bompas, and served as Archdeacon of Mackenzie River from 1914 until 1918. 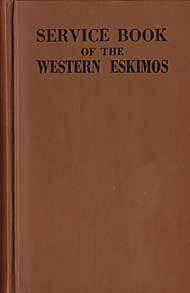 In 1937, he published Arctic Eskimo: A Record of Fifty Years’ Experience and Observation among the Eskimo (London: Seeley). Edward Hester (1882-1945) was one of the first missionaries to work in Aklavik, NWT; he served in the western Arctic from 1915 to 1927, when he returned to England. Herbert Girling (d. 1920) was the first Anglican missionary to serve at Kugluktuk (formerly called Coppermine). His translation of the Gospel according to St. Mark into the Mackenzie River, or Siglitun dialect, was published in 1920. Griffiths lists this translation, published in 1922, as No. 33:2 in his Bibliography of the Book of Common Prayer 1549-1999. This Service Book often abbreviates the services, and typically omits rubrics. It was followed by major revisions in 1949 (omitted by Griffiths) and 1963 (33:4); the current Book of Common Prayer in Inuinakton/Copper Eskimo was translated by Bishop John R. Sperry and published in 1992 (33:5). Map showing the location of speakers of the Inuinnaqtun dialect. Thanks are due to Richard Mammana, who transcribed this text, and to Thomas N. Rae, who provided the original copy.